A police officer in Flagstaff, Ariz., has been placed on administrative leave after a video was posted to Facebook on Wednesday showing him punching a woman in the face, according to a police spokesman. Police Sgt. 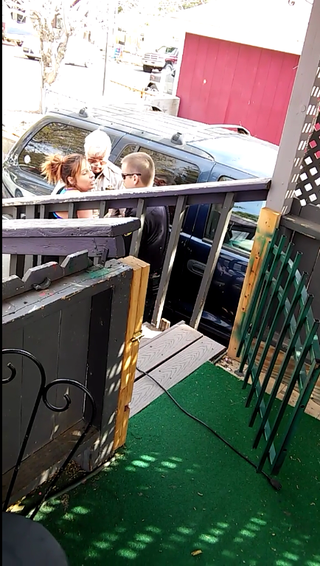 Cory Runge said in a statement that the Flagstaff Police Department “became aware” of the video showing Officer Jeff Bonar striking a woman during an arrest about 7:30 p.m. Wednesday, AZ Central reports. The woman has been identified as 30-year-old Marissa Morris. She told the Arizona Daily Sun that she and her boyfriend had received an eviction notice and were in the process of moving out of their residence when police showed up to make sure they left. What happened next was captured on cellphone video by Danny Paredes, who later uploaded the video to Facebook. Treadway said that Bonar recognized Morris from an Oct. 18 case in which Morris had warrants for failing to appear in DUI drug cases in Flagstaff Justice Court and Flagstaff Municipal Court. “In the video, Officer Bonar attempts to detain Marissa for the investigation of warrants that he believed were in place for her at that time,” Treadway said. Bonar wrote in his report that Morris attempted to run away from him, so he grabbed her to prevent her from escaping. In the video, Morris can be heard screaming that she does not have any warrants, and the Police Department later found that the warrants against her were no longer valid. Bonar wrote in his report that Morris appeared to be intoxicated on a stimulant drug and “exerted an impressive amount of strength for a woman her size.” He also said that Morris physically attacked him, but Morris denies those claims. Treadway said that an off-duty employee became aware of the video Wednesday evening and notified him; the department took action immediately. “Officer Bonar was called into the department on [Wednesday] night, removed from his police powers and placed on administrative leave,” Treadway said. Read more at AZ Central and the Arizona Daily Sun.